The CMU Fine Arts recording studio primarily recorded recitals in Exhibition Hall and made audition tapes for the music students. But when the musicians played at Pittsburgh’s Carnegie Music Hall or the Carnegie Lecture Hall in Oakland, we also recorded there. One night, we were asked to record a harp recital for Marcella Kosikova and she asked if we could carry her harp on and off stage between pieces so she could retune it. 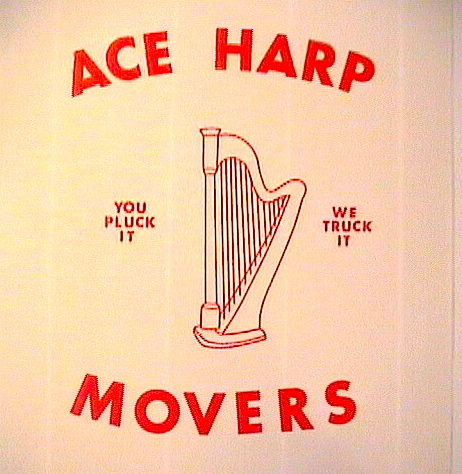 Since we had friends that did silk screening, we created the Ace Harp Movers shirt with the logo “You pluck it, We truck it”. Marcella received one of the shirts and was very pleased and I understand shirts with the logo were seen around the Carnegie Mellon campus for many years after our initial run.